The major reality of my life is that I am human. With all the failings and weaknesses and dreams and disappointments that come with being human. Why would I think I were not human? you might rightly ask. Because for most of our lives, our human-ness does not call us to account. The witchdoctor succeeds for the same reason the rest of us doctors succeed. Each patient carries his own doctor inside him. They come to us not knowing this truth. We are at our best when we give the doctor who resides within each person a chance to go to work. This quote is attributed to Albert Schweitzer, the physician best known for his work in French Equatorial Africa in the 50s. He also won though the Nobel Peace Prize for his philosophical piece, Reverence for Life. The ethical values that underpin the true ideals of civilisation. I got that quote above from an academic book I’m reading at the moment on shamanism. This is part of my research into the third book in the Palace of Fires trilogy, the final book being called Beast. I have to deliver this manuscript to my publishers, Penguin Random House, by October 31st. 100,000 words, or thereabouts. In May, I decided that the only way I could do this was by starting June 1st, and writing 1,000 words a day for 100 days. Now, you may think that writing 1,000 words is no big deal. Believe me, when you’re writing a complex novel – the third in a series which has to bring everything, and every character, to a satisfying conclusion – and it has to be good writing, well, let me tell you, it’s a huge task. I set myself the goal of the end of September to complete the 100,000 words – and it’s the end of September and I’m at 97,685. I have probably another four or five days of writing to complete the manuscript. This then gives me all of October to do revisions, before handing it in on schedule. To that extent, it’s like walking a Camino. It’s best not to think about the gargantuan task of walking across the whole of Spain – just think where you’ll end up that night. How many kilometres you’ll need to walk a day to get to Santiago by a certain date. That’s how I approached this writing task. Day by day – through the power of incrementation. In amongst it though I have been working solidly on PGS – with continual marketing and preparing for the upcoming online release, and also the release of the book of the film, which I will announce very soon. The end result of this though is that I’m knackered – and I simply can’t face the immediate prospect of a long walk – my “Front Door” 3,000km walk which I had slated for November. I can’t keep pushing myself like this. So, that means I will have to reschedule my beloved walk to next year. And next year I want to begin production on my next film in the PGS trilogy: Fear Not. It will look at fear, in all its aspects, and look at how we can live without it. I see it as a companion piece to PGS, and intuition. By the end of this year I will have had two 100,000 word books published by Penguin Random House, I will have written a third, I will have written and had published by Arcadia Press PGS – Intuition is your Personal Guidance System – the 50,000 word book of the film. I will have travelled for five solid months back and forth across the US attending screenings of PGS – and I will have overseen and marketed the online release of that film. I need a rest, before I embark on my next journey. 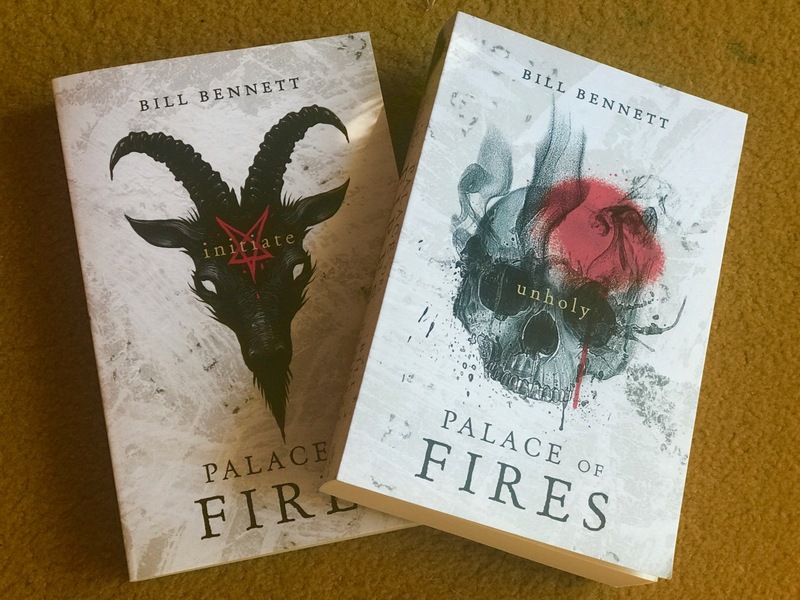 Unholy – the second book in the Palace of Fires trilogy, goes on sale on Monday, Sept 3rd. According to my publishers Penguin Random House, the first book in the series, Initiate, has sold particularly well, requiring several additional reprints. Anyone who read Initiate will want to read Unholy because the first book finished on a cliffhanger, and Unholy leads straight on from where Book1 finished. On the broader front, we’re preparing for the online launch of PGS, which we’ll announce separately – and Jennifer and I are now starting to do PGS workshops around the country – teaching people how to tap into and use their intuition in a real world context. There’s no such things as angels. Oh yeah? Before making PGS the Movie, I didn’t believe in angels. 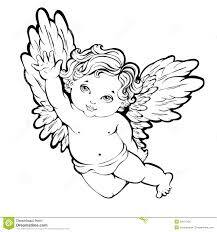 I met people way smarter than me in this stuff who told me about angels, and how they work, and I began to sense their presence, and see first hand how they were helping me. I got this letter today from a bloke I don’t know – a Professor – who saw my film via a good friend, Kurt Koontz, at a private screening in Costa Rica. My wife Paola and I met Kurt Koontz in Costa Rica this June and he invited us to a private screening of your movie about intuition. We sat in a yoga centre in the jungle of Costa Rica and watched the film quietly with about 30 other people that we did not know. During the film I noticed a level of discomfort that I was experiencing however I could not pinpoint what it was. Driving home from the screening, I told my wife, “there is no such thing as angels”, and “intuition is over-rated, it’s all just confusing nonsense. What you don’t know about me is that I have embraced my thinking mind more and more over the years. I am University Professor and a researcher and seemed to have been pulled into my head without realizing that I was. In fact, I have become a sceptic, and after viewing the film felt the discoursing disconnection with my own intuition. The same week as the movie screening I was asked by a yoga centre teacher if I’d like to come for a 3-hour meditation. This was my first meditation longer than 15 minutes. I reluctantly joined and two days after the screening found myself sitting in the same room and in the same exact location that I was sitting when I saw your film. What happened next was completely unexpected. During the mediation, I felt three forceful pokes on my back. I spun around, and no one was there. In that moment, I was visited by two angels that surrounded me on my left and right. I felt a connection to god and the universe in that moment that I have never experienced before. 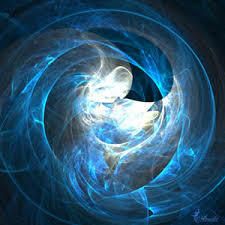 I am now fully embracing my intuition and give you credit for this newly discovered tool that I can use; my intuition. I flow through life now without planning and over thinking. I follow my intuition and allow it to lead us forward with grace, beauty and ease. Thank you for making that beautiful film. 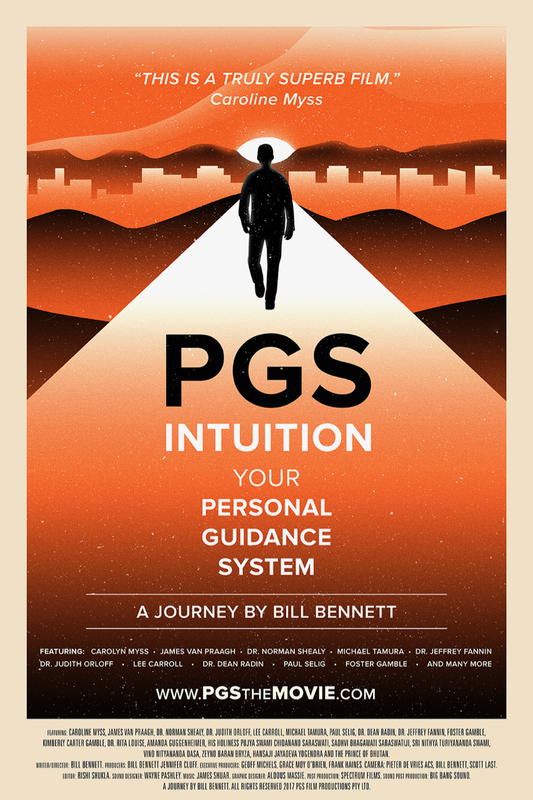 With the release of my film PGS – Intuition is my Personal Guidance System, I’ve been doing Q&As after the theatrical screenings, in Australia and throughout the US. At first I found this completely terrifying, having to stand up in front of a crowd of strangers and talk about stuff that’s intrinsically very personal, but gradually I’ve been getting better at it, knowing that it’s an essential part of getting PGS out to the world. The questions are always fascinating – and one question I get asked sometimes is this: What has been the most bizarre moment you experienced in the making of your film. There have been quite a few bizarre moments, let me tell you! But perhaps none more so than when I met my Guardian Angel in a coffee shop in Dallas Texas. I don’t often tell this story at Q&As, because in the telling it can diminish what I see as the sacred nature of the encounter – because I do believe that what happened was real – but I told a truncated version last night after a screening in Sorrento, Victoria, Australia – and so I thought I would re-publish the two blogs that I posted at the time – December 2014 – which detailed the two interactions I had with the woman who told me she was, indeed, my Guardian Angel. First though, a bit of background: I started filming PGS in September 2014, and so when this happened, it was early into the three year shoot. I was yet to form my opinions about intuition specifically, and my subsequent spiritual beliefs more generally. Jennifer and I had gone to Dallas Texas because several months earlier, a Vedic Astrologer in Bombay had told me, after doing my charts, that the best place for me to expose myself to my “most beneficial cosmic rays” was Dallas, between November and December. The astrologer said that wonderful things would happen if we went to Dallas during that period of my beneficial cosmic rays, and so of course we went. I met this woman at a coffee shop – with me was Rachit San Barak, our camera assistant. On the first meeting Jennifer wasn’t with us – she was the second time we met her. The meetings rocked the socks off me. I still think about it. The thing about the encounters that I still ask myself is: Why would she say what she said? She didn’t want anything from me. And she emanated such a powerful beatific energy. I can’t describe it any other way. My life is becoming more surreal. This morning I met an angel. At least, that’s what she said she was. And I’m in such a trippy head space at the moment, part of me believes her. I went with Rachit to a small corner coffee shop for breakfast. Jennifer didn’t come, she was feeling poorly, so she stayed behind. I was sitting at a large communal table when a woman came up. She was – I’m guessing – maybe 40’s. She had on baggy blue jeans, a nondescript bulky jacket and a woollen scarf wrapped around her head, so that just her face was visible. She could have been a homeless person. She could have been an heiress. There was nothing to indicate either way. Her clothing was also asexual. There was nothing feminine about it, and yet she was a very feminine person. She had a beatific face. It was radiant. No make up. But gentle eyes, a smiling mouth, and clear skin. When she looked at you her gaze was unflinching and searching. It was an honest face. And a mirthful face. If an angel could take human form, then you could believe she was an angel. There were several newspapers on the table in front of me, and she asked if she could take one. I said fine – and she rummaged through, telling me that it was hard to find good news to read. Everything in the newspapers was full of death and darkness, she said. I told her that there was good news too if you want to find it. She rummaged some more, and she began telling me about a fight that had broken out on Black Friday, the big shopping day in the US after Thanksgiving. She told me how crazy it was, that a woman had got injured fighting over a large screen TV. I told her what I’ve posted on this blog, that shopping rage comes from fear. She – You from Dallas? Me – No, I’m from Australia. She – Oh. What are you doing here? Me – I’m here to change the world. She laughing – Really? That’s funny. So am I. Me – You are? And how are you going to do that? She – I can’t tell you. Me, offering my hand – I’m Bill. She, shaking hands. A very firm grip, like a man’s – I’m Madeline. Me – What do you do? She – You won’t believe me if I tell you. Me – I’ll believe you. She – I’m an angel. Me – Are you mad? She, laughing – No. And I’m not on drugs. (then) Are you mad? Me, laughing – Yes, A little. She, laughing – No, you’re not mad. I believe you’re here to change the world. (then) You have a big heart. (turning to Rachit) You have a big heart too. Me – Yes, he does. She – My real name is Mary Magdeline. Me – Are you a Christian? She – No. I’m all religions. Me, turning to Rachit – I wish I’d brought the camera. We really should be filming this. She – I wouldn’t have let you. Me, writing down the PGS blog address on a scrap of newspaper, handing it to her – Here. Read this. It will explain why I’m here. (Then, to make it clear this was not a flirtatious encounter) – My wife is in the hotel next door. She isn’t feeling well. She – Oh. I can heal spiritually. I can heal by touch. Inside and out. Me – Thanks. But my wife just needs to rest. (then) How can I contact you? I might want to film with you. She – You can’t. (then) Do you have a business card? I gave her my business card. She – I will call you. Me, getting up to go – Okay, nice meeting you. She – This was no accident. Me – I don’t believe in accidents. She – You know we were meant to meet here. Me – Yes. It was in my destiny. And then Rachit and I left. I don’t know what compelled me to say: It was in my destiny. it just came out of my mouth before I could stop it. I have to say, I was really shaken up by the whole encounter. It was like a dream. Like it was on another plane of existence. You just don’t have conversations like this with a stranger in a coffee shop. Walking back to the hotel, I asked Rachit if he believed she was an angel. He just smiled, and nodded his head. Yes, he said, I believe it. I went back to my room and told Jennifer. She listened and she too nodded, as though it all made complete sense to her. I met her again today. My angel. She told me she was my Guardian Angel. And that she loved me. I introduced her to my wife, Jennifer. Jennifer thought she was an angel. Someone with an expanded consciousness, she said. Later, I went and talked to her again – Madeline. Mary Magdeline, she reminded me, like in the Bible. Me – How will you change the world? Me – When is this going to happen? She – You will know. Me – How will I know? She – Because you will be with me, by my side. She – Yes, we have been together before. I have been a part of your life, in the past. She – You don’t believe me? Me – Yes, I believe you. She – And I will be with you later, too. When you need me. I’m your Guardian Angel. Me – Are you mine exclusively or do I have to share you with other people? She, laughing – I’m everyone’s. There is only one Guardian Angel. Then she cupped my face in her hand, looked at me with radiant love, and said: I love you Bill. PGS – help us get it out to the world! Two weeks today we launch a crowdsource funding campaign. It’s to raise funds to help us get PGS the Movie out to the world! The campaign will be on Indiegogo – and we’ll be seeking funds to create foreign language versions, DVD premium extras, such as extended interviews and “chapters” we didn’t include – and it will also go towards marketing the film world wide. We want to make the world more intuitive, and we’re going to need your help!